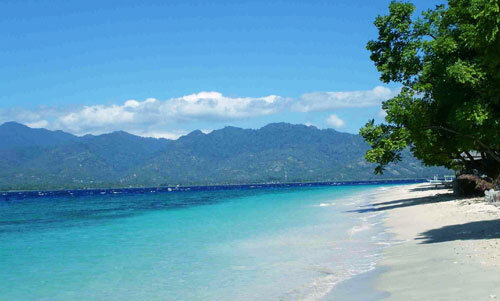 is the nearest Gili to Lombok. It is also the most populated and you will find more trees there than the other Gili’s. The local inhabitants are: Sasak, Mandar, Bugis and Makassar. You can find their different unique culture from Lombok and wonderful beaches. Many of the older generation still make their living as boatmen, fisherman and farming coconuts. There are only a few number of 2-3 stars hotels (rooms with air conditioning, swimming pool, TV etc) on . Most of the places to eat and stay are in south and east side of the island (near the jetty). You can find many home stays or budget accommodation on this island. Not much things happening for the last 3-5 years. One of the first dive schools (The Reef seeker) is no longer operate from . They have moved to Flores. Returning guests are what they expect to come. Most accommodation are locally owned and managed, while a few of the up market hotels own and managed by foreign investors. You can go from one island to another by joining Gili Island’s hoping boat (depart twice a day). People here are friendlier than on Gili Trawangan. There are also a few places to stay around the north and south west coast in quieter atmosphere. There are many activities that the tourists can do in this island. Snorkeling and diving are the highlight of the activities. Snorkeling area are located in the southeast (opposite-facing Lombok Golf Kosaido) and along to the northeast). The tourists can just jump into the water to see the colorful fishes and coral reef. In the western part of you can’t snorkel off the beaches. When the moon is high (low tide), you can’t swim off the beach. You need to walk to the south or east side.